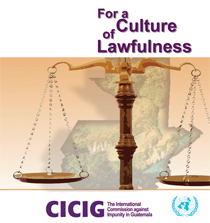 The mandate of CICIG refers to a limited number of cases that involve illegal groups and clandestine security structures. To lodge a complaint you should contact the Oficina de Atención Permanente del Ministerio Público [Assistance Bureau of the Public Prosecutor's Office]. For more information contact: 2411-9191. Other communications intended for CICIG should be sent to Apartado Postal 934 "A" Guatemala, Guatemala, C.A.